В ролях, помимо актеров: Chuck Berry, Jerry Lee Lewis, Screamin' Jay Hawkins. 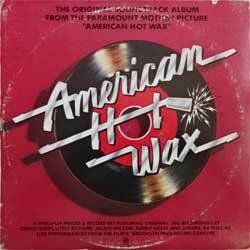 1978 A&M Records original pressing, made in USA. 2 пластинки в раскладывающемся конверте (gatefold). Tracks: Introduction Of ALAN FREED; BIG BEAT BAND - Hot Wax Theme, PROF.LaPLANO & THE PLANOTONES - Rock And Roll Is Here To Stay. DELIGHTS - Mister Lee, DELIGHTS - Maybe, CLARK OTIS - Hey Little Girl, CHUCK BERRY - Reelin' And Rockin', CHUCK BERRY - Roll Over Beethoven, THE CHESTERFIELDS - Why Do Fools Fall In Love, THE CHESTERFIELDS - That Is Rock And Roll, SCREAMIN' JAY HAWKINS - I Put A Spell On You, TIMMY & THE TULIPS - Mister Blue, JERRY LEE LEWIS - Whole Lotta Shakin' Goin On, JERRY LEE LEWIS - Great Balls Of Fire, CHUCK BERRY - Sweet Little Sixteen, JACKIE WILSON - That's Why, THE MOONGLOWS - Sincerely, THE DRIFTERS - There Goes My Baby, THE MYSTICS - Hushabye, BUDDY HOLLY - Rave On, MAURICE WILLIAMS AND THE ZODIACS - Stay, LITTLE RICHARD - Tutti Frutti, THE CADILLACS - Zoom, THE ELEGANTS - Little Star, THE TURBANS - When You Dance, BOBBY DARIN - Splish Splash, FRANKIE FORD - Sea Cruise, THE SPANIELS - Goodnight, It's Time To Go. Состояние винил отличное, конверт очень хорошее+.